If your trip to Japan is guided mostly by your stomach, Osaka is the best place to start your feast. Losing out to Michelin-starred Tokyo to the east, or the refined court cuisines of enchanting Kyoto to the north, Osaka, nestled down on Japan’s Kansai coast, is often underappreciated when it comes to food tourism. But if you’re considering a gourmet pilgrimage to this food-focused nation, Osaka means business. With its local motto, ‘kuidaore’ (‘eat until you drop’), and its national nickname, tenka no daidokoro (‘the country’s kitchen’), here are our must-eats in the city that satiates. Cooked DIY on a communal grill or by a deftly-handed chef who’ll flip together this cabbage pancake before your eyes, okonomiyaki is the king of Osaka’s cuisine. Mixing cabbage, eggs and a dashi-flavoured, yam-flour batter – as well as pork, noodles or anything else on offer (okonomi translates to ‘as you like’), this hearty dish is topped with mayo, sosu (a Japanese-style Worcestershire sauce), seaweed and bonito flakes. Where to eat: Known as Osaka’s ‘soul food’, home-style restaurants make the most authentic okonomiyaki; family-run Mizuno has had lines out the door for more than 70 years. 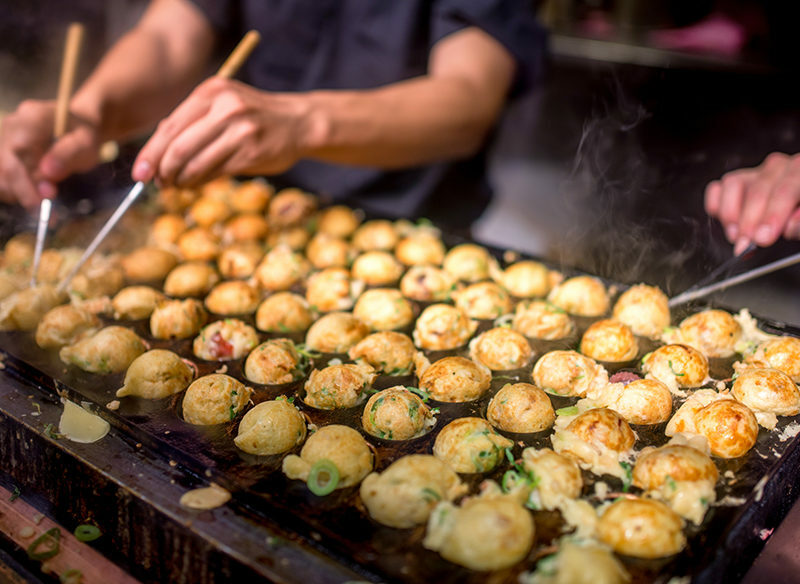 The essential Osaka street food, these crisp balls are simply made with a dashi batter and studded with a chunk of tender octopus tentacle poured in a hole-filled cast-iron plate. 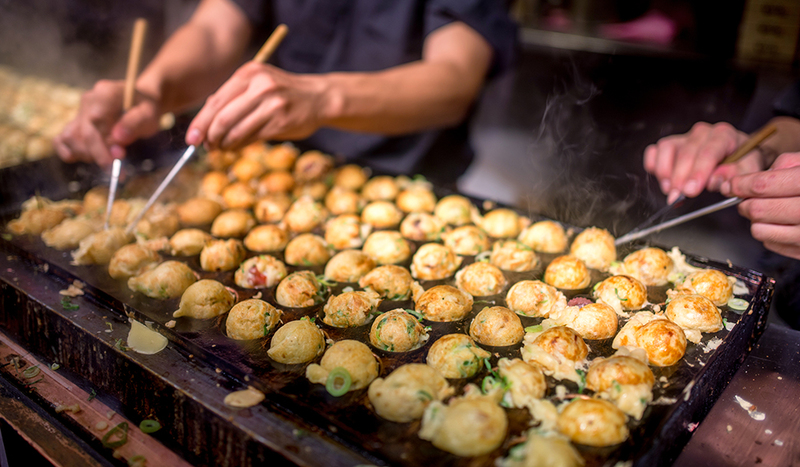 Although a beloved street snack, takoyaki are said to pair perfectly with cold beer, so you’ll also spot them on menus in izakayas (Japanese pubs). Where to eat: Head to Dotonbori, Osaka’s lively food street, to see both tourists and locals alike lining up for takoyaki late into the evening. Less than one hour from neighbouring city Kobe, Osaka has access to some of the country’s most respected beef. Kobe’s Tajima-gyu cattle are said to listen to classical music, drink beer and get frequent massages – this relaxed life developing unique flavour with high marbling. Yakiniku restaurants offer tasting menus of Kobe beef from all parts of the cow, which you can cook to taste on the table’s grill. Where to eat: The ancient laneway Hozenji Yokocho is praised for high-end yakiniku, but if you like it cheap and cheerful, catch the subway to Tsuruhashi, a station surrounded by lively barbecue options. These deep-fried skewers were popular with the working class during the 1930s, after the dish was invented by still-running Osaka restaurant Daruma. Now loved by everyone, anything goes when it comes to ingredients – pork tenderloin, shiitake and lotus root, quail eggs and asparagus are all popular picks. They’re served with a thin sosu dipping sauce – no double dipping! Where to eat: The colourful, older neighbourhood Shinsekai is the original home of kushikatsu, with many restaurants open 24 hours. You can find Daruma’s first location here (as well as Dotonbori) ­– their recipe is still top secret. Settled on Osaka Bay, the city’s seafood is some of the freshest. Dotonbori hosts a number of famed seafood sellers, including Zuboraya’s raw fugu, the toxic pufferfish, and Kani Douraku, an iconic crab restaurant seating more than 300 people. For high-quality sushi and sashimi, beeline to Osaka’s enormous Central Wholesale Market, where the ideal breakfast is raw tuna sashimi. Where to eat: Kurumon Ichiba Market has been hawking some of the best seafood for more than 190 years and draws daily crowds for fresh sea urchin, buttery grilled scallops, fish cakes and sushi. We’re not talking about the rich bowls of ramen celebrated across Japan (although Osaka certainly has its fair share). Instead, it’s the humble instant ramen, or cup noodles, first created in Osaka in 1958 by Momofuku Ando that have our attention. These noodles even have their own interactive museum, where you can learn their history, and even make your own cup noodle, choosing the flavour combinations and design. Where to eat: The Momofuku Ando Instant Ramen Museum has a tasting room, noodle theatre, exhibition gallery and more. Getting there: Osaka’s Kansai international airport hosts direct flights from Australia, or catch the Shinkansen bullet train from Tokyo in just two-and-a-half hours. Staying there: If eating is your main motive, it’s best to stay near Dotonbori. Nipponbashi, Namba and Shinsaibashi are lively, convenient spots. Travelling to Japan soon? Read our guide to everything you need to know about Japan.